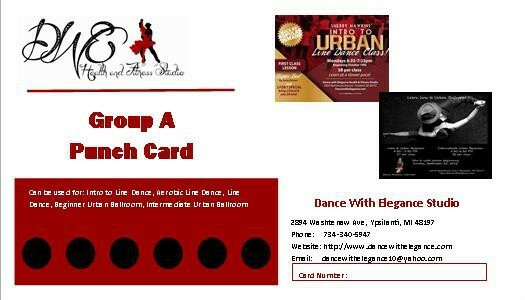 Purchasing Dance With Elegance punch cards provides a more convenient way to enjoy your favorite class. 1. Dance with Elegance classes are grouped as follows. *Zumba and Zumba Step are not included. Please contact our Zumba Instructors for more information on classes and punch cards. 2. 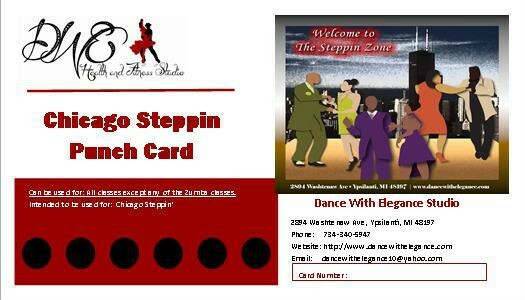 Each punch card contains (6) punches that may be used for either Group A, Group B or Chicago Steppin' classes. The Line Dance Hustle for ladies, punch card contains (8) punches. The punch card can be used for any combination of classes associated with the Group represented by the card. 3. Punch card(s) must be presented when attending class. 1. There are no expiration dates associated with a purchased punch card. 2. Payments for punch cards are non-refundable. All sales are final. 3. Dance With Elegance is not responsible for lost punch cards. 4. Punch cards must be presented to the cashier at the beginning of class for each class. NO EXCEPTIONS. 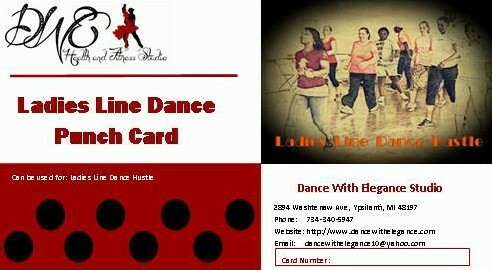 Punch cards not presented to the cashier at the beginning of class will result in full payment for the class at the drop-in rate of $5 for Ladies Line Dance Hustle, $7 for Group A classes , $10 for Group B classes and $10 for Chicago Steppin classes. NO EXCEPTIONS. 5. A punch card can be used by multiple people. Punch card(s) can be used by groups attending a class. Punch cards can be given as gifts.